In the last of this short series about the use of moulding planes I'll be looking at ways in which this tool can be used to enhance the appearance of your back panels. There are many examples throughout history where the back of a piece of furniture is visible and the panels are given some decorative treatment in acknowledgement of their exposure. For those of us who like to study furniture there's no face that will not come under scrutiny or will not be of interest. We are as much in awe of the hidden treasures behind the construction as we are of the more obvious statements of design. Examples of furniture attributed to the Shaker movement can be found finished as well inside as they were outside. Although not decorative by today's standards, the detailing came about as a result of their making processes. Dowels and beads, unseen or not were executed with precision to get as close to perfection as possible and therefore closer to God. I've often heard it said that Thomas Chippendale invented plywood. I wouldnâ€™t like to vouch for this fact but in relative terms the use of sheet material in furniture construction is something quite new. The expanse of a back panel has traditionally been made from solid material considered at the time to be of an inferior grade. 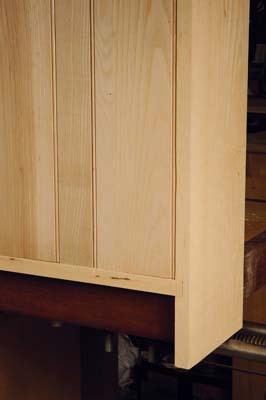 The open fronted dresser is perhaps the most obvious example of old furniture to feature a visible backboard. 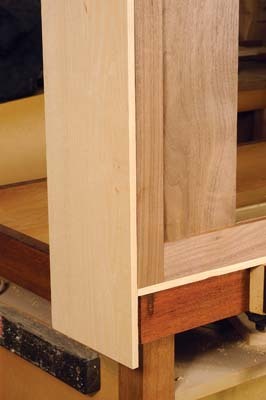 Later examples would have a row of interlocking matchwood every bit as structural as the rest of the carcass. To the untrained eye it's a detail that goes largely unnoticed. The method of fixing these panels varies from century to century and has some regional differences, but by far the most attractive approach was to create a framed panel. The expanse was divided by stiles and rails as necessary and housed into a rebate. The frame being secured with screws so that the loose panels were free to expand and contract at will. C&J Hampton who made the original Record planes and tools, including the versatile no.045, published a very interesting book in 1934 entitled Planecraft, with the subtitle Hand Planing by Modern Methods. The fundamentals of construction shown in this book and others have been a great source of inspiration for these articles on hand work using simple tools, in particular the Record 45 combination plane. D. The cost of the material is negligible, you make just as much as required and don't have to buy considerably more than you need. Handmade mouldings are always worth considering. They are the maker's signature and every bit as individual as the piece itself. Details can be produced by machines but nothing replaces the satisfaction gained from the experience. Like many of the tools mentioned in this series this very useful book is available, second hand on the internet for a few pounds and I would recommend it to anyone wanting to make the full use of hand and moulding planes. 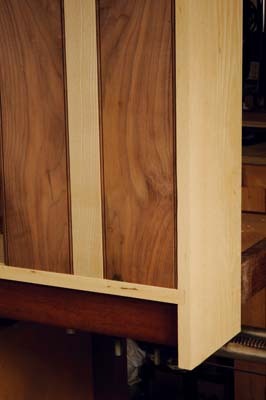 Interlocking matchboard features a tongue and groove and in theory can be made up of random width boards. For a seamless finish on an exposed face, prepare the ends of the boards with a tongue and drop them into a corresponding groove. The use of contrasting boards can be used to create a dramatic appearance without the need to produce a frame. Examples of framed panel backs can be found with the frame planted directly onto the edge of the carcass sides. A much neater way is to create a rebate around the inside of the carcass. 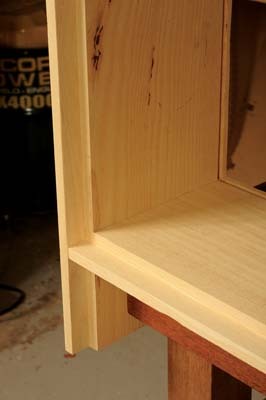 If tops, bottoms, shelves or other dividers are housed into a dado of the same depth as the rebate it can be run through to the end of the board.